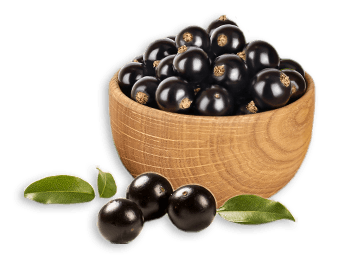 JabuVital® is a new and improved Jabuticaba juice powder from the fruit growing on the trunk of the Jabuticaba tree, otherwise known as “Brazilian Grape Tree”. Jabuticaba is a slow growing tree that is grown for the delicious purple, grape-like fruits it produces. Jabuticaba has white flowers that grow directly from its trunk. The purplish black fruit is 3-4 cm in diameter and grows directly on the trunk and branches of the tree. This gives the fruiting Jabuticaba tree a distinctly exotic appearance. Jabuticaba’s deep purple skin covers a sweet translucent white to rosy pink flesh with a sub acid tang. Jabuticaba fruits are readily available in Brazilian markets where they are mainly eaten fresh. Because the fruit begin to ferment 3-4 days after harvest, fresh fruit is rarely available outside of growing areas. Jabuticaba’s striking color and delicate flavor impart unique qualities to jellies, ice creams and other desserts. Jabuticaba makes a refreshing juice drink with a flavor that is compared to grape, blackcurrant, lychee, mangosteen and guava! The fruit is also appreciated for its exotic fragrance. JabuVital® contains several potent antioxidant compounds which have been isolated from Jabuticaba fruit, including jaboticabin, a new depside unique to Jabuticaba. Jaboticabin is being studied for anti-aging applications. Jabuticaba is a good source of Vitamin C.
The name Jabuticaba, derived from the Tupi word Jabuti (tortoise) + Caba (place), meaning the place where you find tortoises. Jabuticaba is one of Brazil’s favorite fruits. The tree grows very slowly, up to a maximum of 10m, but is only half a meter tall in the first few years. This makes the young Jabuticaba tree a popular bonsai plant. The peeling bark is pale brown with small white flowers growing in clusters directly from the trunk and branches. Within a month of flowering the fruit is formed. The fruit has a thick skin and contains a white translucent pulp comparable to that of grapes.